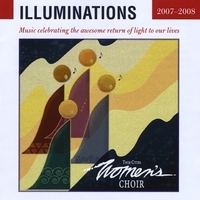 Illuminations album was recorded live from three Twin Cities Women's Choir concerts reflecting on the annual return of light to our lives. we sing illuminations—songs that bring light and hope in the dark of winter. Our illuminations—our incantations—today are about kindness. How do we nurture the light that is within us to reach out to others kindly, to act gently, to speak warmly? As we sing, we call on those who have gone before us to be with us. We ask for their light to lead us once again from darkness. And these kindnesses that we share each day—they allow that Light to grow stronger within us. We feel Hope return, not because the world outside us is changing, but because we are changing ourselves, and know that we impact the world around us. And when we are open to the Light, a thankful and joyful spirit washes over us. We know there is beauty here. There is warmth here. And we sing with each other to spread the Light not only in this season of cold, but every day we live.